There are people out there I trust with my life: family, friends high school, from college, new friends that I've made along the way. And then there are people who come into your life for vanity purposes, but they become like an extension of your friendship circle in a way. I get questions all the time about coming in to different salons to meet stylists or colorists, but I never follow through with those offers (besides a random blowout or keratin or something like that). I've been seeing my hair colorist, Aura, for years. I actually knew her long before I went to see her for hair color and once she started painting my hair I was kicking myself for not going to her sooner. My stylist, on the other hand, is someone I've only recently been going to, but the minute I met her I knew we clicked. The longest layer of my hair was halfway down my back and I walked in, spouting off obscure requests like "just cut it off" and "make me look like Alexa Chung". Any rookie hairstylist could just start chopping away at my hair, but Jenny Balding. from Cutler just kind of GOT ME, giving me the haircut of my dreams. It's been a match made in Heaven ever since. So besides my random experiences with Aura and Jenny, I feel like a sort of proud mother when I see these women do amazing things with hair during Fashion Week shows. Aura is a color ambassador for Wella Professionals and Jenny is a brand ambassador for Redken, so these girls KNOW HAIR. Their knowledge of hair is only rivaled by their ability to be creative. Obviously they've been doing this since long before I met them, but I can't help but feel a swell of pride puffing up my chest every time I see their work. 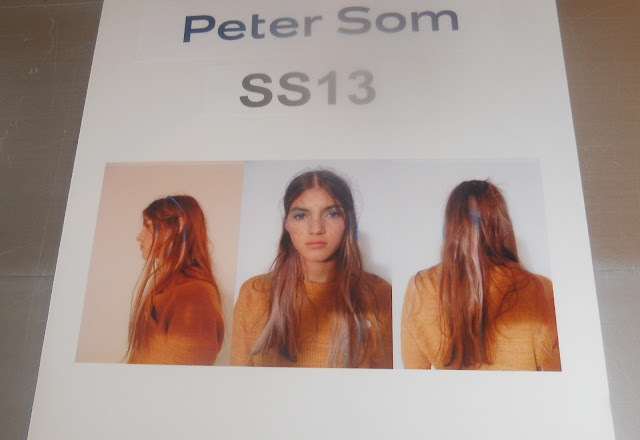 This Spring 2013 Fashion Week Aura did the color for Peter Som again, and once again it was genius. Jenny was the lead stylist for the Rachel Antonoff show, a show that she admits is a favorite of hers to do because she just clicks with the designer. 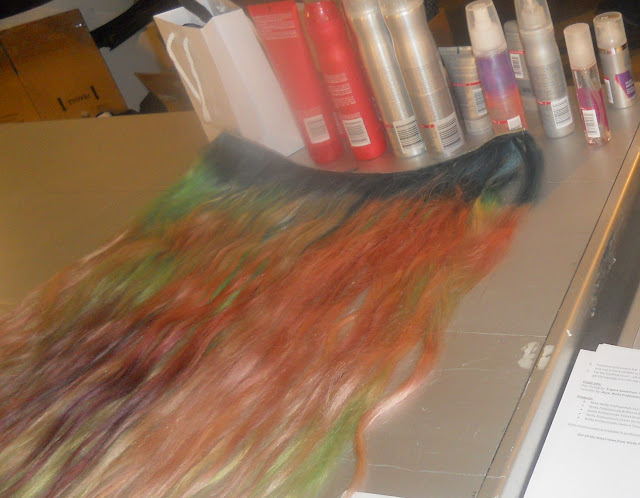 Aura painted wefts of hair with "metallic pastels" that were partly inspired by the great Impressionist paintings, and partly inspired by the girl that would wear these colors. "This girl is very disheveled. She's a rich girl gone bad, she's living in the east village, she parties every night until 4 am. AT Least...if not having an after party at her house. And she just rolls out of bed with her hair all messy and unkempt. But she has money to go to the salon and get this crazy color... and then she let it fade. I t's dusty, it's grungy, it's unkempt...but it's still super cool, and a little bit luxe in a way." Ever the commitment-phobe when it comes to drastic hairstyles, I'm loving the faux undercut that was done at the show. My hair certainly doesn't grow fast enough to commit to a real undercut, but this is beyond easy to try at home to get the same effect. The inspiration for this look was "country club girl, gone bad"... are we noticing a theme here in the styles I like/stylists I choose? Anyways, there is still an element of sexiness to the straight, sleek part of the hair, and then the naughtiness of the undercut effect. First the hair was given a clean part, a bit off the center, and prepped with Redken Align 12 Protective Straightening Lotion before blowing the hair out. The hair was flat ironed to make sure it was completely straight and smooth, before sweeping the left side back, underneath the hair and securing at the nape of the neck with a small elastic. She finished the look with a shot of Redken Fashion Work 12 Versatile Working Spray.